Passionate about building and nurturing a love of the performing arts in children and young adults, for fun and personal growth – or the start of a professional career. 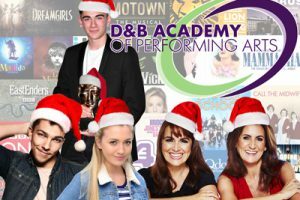 At D&B Theatre School we offer a diverse and balanced timetable of dance, Acro, acting and singing classes for children. All our students have the opportunity to take exams and give performances – and the flexibility to take just one class a week, or a mixed timetable to try their hand at everything! Our qualified and caring faculty team bring a wealth of experience from their respective fields. They believe in nurturing and developing student’s skills in a safe and happy environment – and making the experience fun. At D&B Theatre School we are passionate about creating a personal experience for each and every student. We are always happy to discuss a suitable programme with you – to suit both your child’s needs, and your aims and financial considerations. Similarly we are happy to provide written progress reports and discuss these with you – simply book an appointment. To book in an appointment we will need to speak to a parent/guardian who will be required to attend your appointment to look around with you.